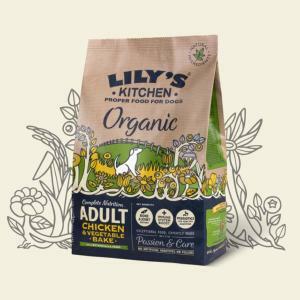 Lily's Kitchen customers tell them that their complete hypoallergenic, wheat-free organic chicken and vegetable bake is simply the best. Maybe it's because they use a unique variety of pesticide-free wholesome ingredients or it's because they can see how healthy and shiny their dogs are on their food. This delicious dog food is also low in fat as it's made with completely natural, certified organic ingredients. Only real meat: no rendered animal parts or derivatives, nothing genetically modified, no artificial preservatives, colours or sweeteners. No wheat, corn or soya. We use only wholesome meats, grains, herbs - flowers and leaves, fruit and vegetables - to produce a delicious, digestible food for dogs. Suitable for adult dogs and puppies 4 months +.